Since 1985, we’ve been committed to providing excellent customer service and our attention to detail has made our company extremely successful. Our reputation for excellent service and high value makes C&T Courier the trusted choice among companies whose success depends on the prompt, reliable transport of sensitive or time-critical cargo. From scheduled and emergency deliveries to dedicated same-day deliveries for healthcare – including long-term care pharmacies, diagnostic labs, and hospitals – C&T is a critical link in the value chain for thousands of businesses. 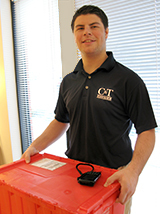 Call us to learn more about why our customers continue to choose C&T Courier for their delivery management year after year. Call us to set-up your personal account or for a delivery using your credit card.